Batik is one of Java's famous and highly developed art traditions, together with wayang (shadow puppets), gamelan (Javanese orchestra) and keris (the dagger - heirloom). Anywhere, batik designed materials are clearly seen as women traditional dresses, shirts, uniforms, sarongs, bags, hats, table-cloths, napkins, painting and decorative items, etc, with traditional color of brown, indigo and blue or more colorful ones. 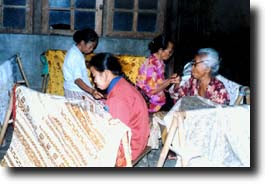 Nowadays, batik is an important industry in many production centers in Java. It is a proof that the people of Java do love the products, long time ago created by their ancestors..
Sido Mulyo : Sido (you should be ), mulyo (happy). Symbolizing 'you should be happy and rich man'. Sido Dadi : Symbolizing 'you should be a man/woman as you wish (prosperous, high ranking position, wealthy, etc)'. Satrio Wibowo : Symbolizing 'Man with dignity'. Tikel Asmorodono : Tikel (more), Asmoro (love), Dono (gift). It is meant the one who wears this batik, should be loved more and more by others. Informal Dresses It is a free choice, usually for daily casual wear. Formal Occasions In some parties, as a state banquets, receptions, etc, the invitees are requested to wear batik. Long sleeves shirts for the men and 'kain batik' (long batik to cover the lower body) for the women. Traditional Occasions It is worn to present the traditional wedding ceremonies, special ceremonies for the Royal families, etc. Kebaya It is a traditional long sleeved shirt (the material used is not from batik, usually from silk and other fine materials). Selendang It is used as attractive piece of clothing to compliment the traditional dress. The 2 m x 0,5 m selendang cloth hung over one shoulder. Kemben or Semekan It is special for ceremonies in Karaton (palace) or Royal family ceremonies. Instead of wearing Kebaya, to cover the upper body, a kemben is worn. Jarit or Bebed Men kain panjang, tightened with stagen. Surjan Men traditional long sleeved shirt (only for Yogya style) and the material is not batik. Beskap Instead of wearing surjan, the men wear a coat (beskap of Solo style or Atila of Yogya style), the materials is not batik. Blangkon It is a headgear made from batik. Keris The dagger is worn at backside of the waist, as a compliment to the dress. The meaningful contribution of your mind reflects on those people who are looking for new ideas and information regarding different dress design . Thank you for giving this type of information.